Ecobank Aichi, a Japanese non-profit organization (NPO) based in the city of Ichinomiya in Aichi Prefecture, has published a booklet entitled "Green Curtains: A Teaching Manual" for elementary and junior high schools. The NPO started distributing copies of the booklet in May 2008, free of charge to schools within the city, and will send it across the nation upon request. 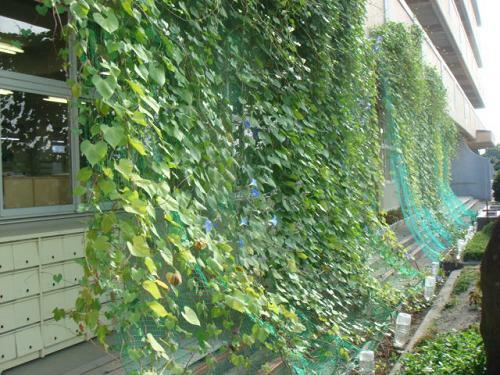 The organization intends to promote environmental education through the project to reduce carbon dioxide emissions and to ease the summer heat using "green curtains" formed by climbing plants covering the walls and windows of buildings. Members of the NPO, including education experts, compiled the 20-page manual on how to create a plant curtain and the contents comply with the curriculum guidelines for each grade at elementary and junior high schools. The manual lays out monthly procedures to be carried out from April to September and specific teaching points for actual classroom situations, including methods of utilizing school properties and providing water effectively during long summer holidays. A spokesperson from the group said, "We expect the manual will help children grow green curtains appropriate to the circumstances of each school. We also hope that the use of green curtains will eventually spread to local communities through our support for the eco-activities of school children." The organization intends to revise the manual annually over the next few years based on feedback from schools. It also plans to produce versions of the manual for households, kindergartens, and nursery schools.